Did Your Doctor Put a Toxic Metal in Your Brain? Home/Brain Science/Did Your Doctor Put a Toxic Metal in Your Brain? Chuck Norris is suing his wife’s doctors for exposing her to a toxic metal during a medical scan. Researchers warn that this toxic metal, used in taking diagnostic images of the body, may enter the brain and never leave. The Food and Drug Administration (FDA) insists there’s nothing to worry about. But if you’d like to make up your own mind. The questionable toxin used in many medical scans is called gadolinium. It’s serves as a “contrast agent” in up to half of all MRIs (magnetic resonance imaging scans) in the US. As you probably guessed, I think there’s good reason to worry about the common use of this toxin. Last summer, the European Medicines Agency banned a trio of gadolinium-containing diagnostic contrast formulations. The United States has not followed suit. In this controversy, one thing is for certain. If you undergo an MRI and receive gadolinium, small amounts of the metal can end up in your brain for years. Maybe for the rest of your life. The effects of that brain-contaminating heavy metal? No one knows for sure. And according to the Mayo scientists it’s possible that everyone who has had an MRI-related infusion of gadolinium retains the toxin in brain tissue. Experts once believed that the blood-brain barrier, which keeps many toxic substances in the bloodstream from entering the brain, was enough to keep gadolinium out of the brain in people enjoying normal health. But that turns out to not be true. The Mayo study involved autopsy analysis of neurons and brain tissue from people who had between four and 18 MRIs each. It shows that significant traces of the gadolinium used in the MRIs were deposited permanently in the brain. “Our results suggest current thinking with regard to the permeability of the blood brain barrier is greatly oversimplified, as gadolinium appears to accumulate even among patients with normal brain tissue and no history of intracranial pathology,” warns McDonald. Israeli researchers who have looked at what happens to gadolinium in the body warn that gadolinium is difficult to remove. 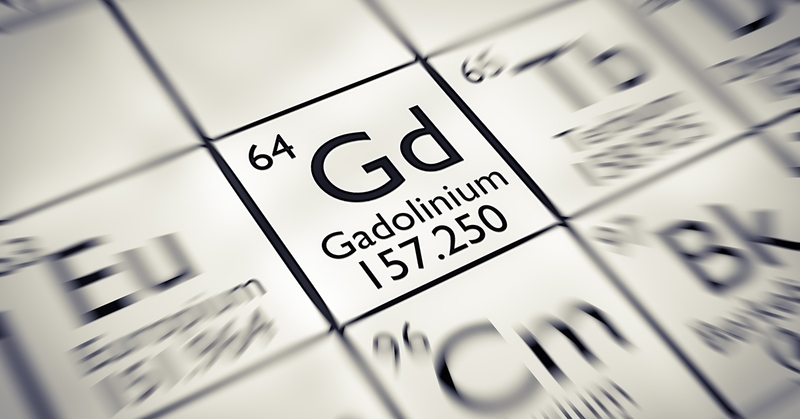 “Although gadolinium is bound to chelating agents designed to flush out the rare metal following an MRI, it has been found to deposit in the brain, bone, and other organs,” says researcher Moshe Rogosnitzky. I agree with these alarmed researchers. If you are having imaging done, avoid contrast agents containing gadolinium. Other types of chemicals are available for these tests. Make your concerns know to your healthcare provider. I’ve had several MRIs during my life. I’m relieved that none of them involved an injection. Next time I need an MRI, I plan to question whether a contrast dye will be required.